This is the perfect fishing package for anglers of any skill level who want three to seven full days of fishing. At the end of the day, you return to your hotel, hopefully with a string of fish for dinner! Are you the angler in the family and want some fishing days, or maybe you like to fish with a buddy or family member who would love this trip. 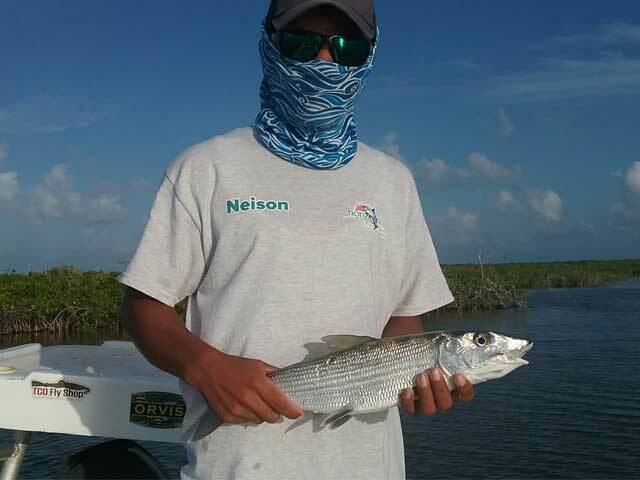 This is exciting fishing and we will work hard to give you a chance at the Belize challenges – Tarpon, Snook, Snapper, Jack, Cobia, Grouper, and Barracuda. These fishes are tricky! 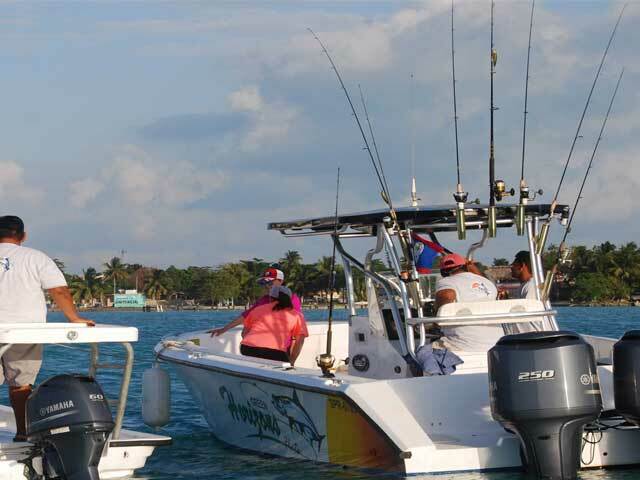 This package includes lodging at the Crimson Orchid Inn, thecrimsonorchidinn.com, or at our partner hotel in San Pedro, The Ocean Tides (www.oceantidebeach.com, and your choice of full fishing days from either location. Transportation from the Belize Airport to Orchid Bay is available. We start early each morning exploring some lagoons and mangroves until the Guide sees signs of fish. Their job is to guide you to the fish, and give you whatever support you need…. catching the fish is up to you! Picnic lunch on board whenever you get hungry or, if the fishing is good, we can pull into a sandy beach for a BBQ. There is always a cooler with with pop and water on board… Let us know what you want us to include for you. 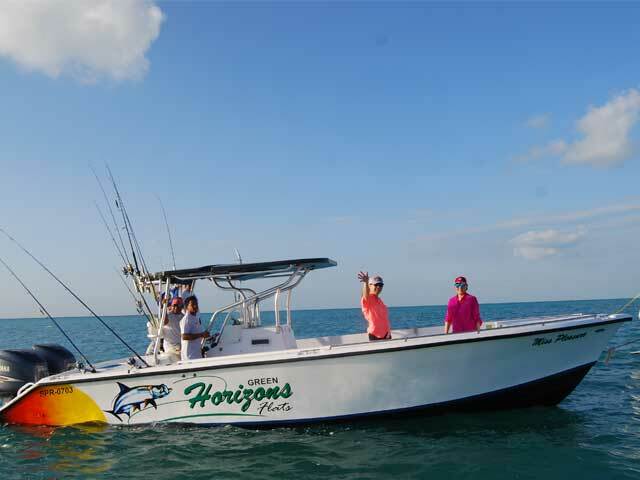 The Green Horizons Flats Fishing Captain and crew will give you a safe, comfortable ride. The Guides are patient and very helpful with any skill level, and we want you to have a great experience whether you catch any fish or not. Lodging for this package is at At Orchid Bay, breakfast is included. Stephen Honeybill and Morgan Honeybill are your hosts. There is a full bar/restaurant within steps. Each fishing day starts after an early breakfast from either the Orchid Bay Pier or the pier nearest the Ocean Tides. We board Miss Pleasure for a full day of exciting fishing! We return late afternoon and the evening meal is on your own at either Tradewinds Restaurant at Orchid Bay or one of the great San Pedro restaurants. We will be fishing from Miss Pleasure, our newest vessel (see Our Gear page), perfect for whatever type of fishing you want to try. Your local fly shop can help you with gear. Our Fishing Info page has Our Gear for rods, reels, leaders, etc. and What to Bring. You can check out our Fishing Info page to see what to bring, and we are always here to answer your questions. Miss Pleasure has water, snacks, and pop in a cooler on board. Let us know what else to include for you. 2 to 6 days fishing (3 to 7 nights), Miss Pleasure, Captain, Guide and crew, picnic lunch or beach BBQ, safety gear, snacks, water and soft drinks. Alcoholic Beverages (can be ordered in advance), Gratuities. Evening meals. This is a great fishing package and Green Horizons Flats Fishing works with our lodging partners to give you a great fishing day, a great night’s sleep, and a great rate. If you need transportation to and from the airport in Belize, let us know how we can help. Flights into Belize International Airport all connect to Tropic Air or Maya Air to get you directly to San Pedro on Ambergris Caye or Corozal. Holidays are popular travel/fishing days. If you want to schedule a package that falls on New Year’s Day, Christmas Day, or the Easter holidays (Good Friday to Easter Monday), add 15% to the total package cost. These spots fill up quickly!